Many employers will match, double, and sometimes triple their employees’ contributions to charitable organizations. Please check with your company to see if they participate in a matching gift program and contact us for any documentation you may need. 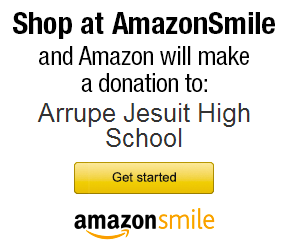 One of the easiest ways to support Arrupe Jesuit is to leverage what you're already spending on Amazon. The AmazonSmile Foundation will donate 0.5% of the price of eligible purchases to the charitable organizations selected by customers. Visit smile.amazon.com to learn more! Gifts of Securities, real estate, used cars, and much more have the ability to impact the students of Arrupe Jesuit High School. Contact us to discuss your gift. Gifts such as professional services, school supplies, professional clothing, items for our silent auctions, and much more are meaningful ways to contribute to Arrupe Jesuit. You’ll receive a gift receipt to maximize your tax benefits. Contact us to confirm we can accept your gift in kind.